I adore Trevor Noah. I appreciate his comedic style. I find him to be intelligent, quick-witted, funny, and I'm not gonna lie, easy on the eyes. 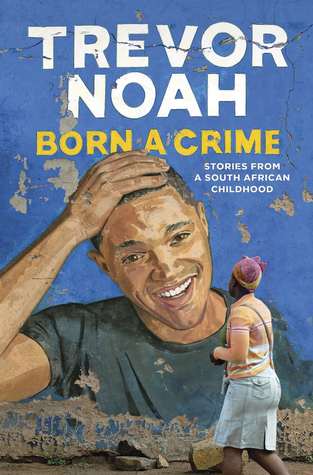 When I heard about his memoir, Born A Crime: Stories From a South African Childhood, I immediately added it to my to-be-read list on goodreads.com. This year, I've vowed to learn how to really listen and pay attention to audiobooks. In addition to my traditional reading, this has quickly helped me get through more reads. I've found that listening whilst on the treadmill is a way to metaphorically kill two birds with one stone. And as any reader knows, the more you can read; the happier you are. So, I thought this book would be a good one for audio. Noah opens the autobiography with a story that illustrates the relationship between he, someone who seems to struggle and question faith, and his mother, a lifelong and devout Christian. This theme not only sets the stage for what is to come but permeates the entire book. When I decided to read this, I thought I might get some laughs. Don't get me wrong, there are some funny parts. But since I have listened to the book, I've heard that Noah intended the book to be a tribute to his mom. Now knowing his intention, I would say he did not fail to accomplish the task. It was nice to get to peek into his life. (Isn't that always fun? That's why we are a reality TV society.) But more importantly, learning of his love for his mother and hearing it through his own voice as he narrated the book truly made her the heroine. The stories he shared were heartfelt, and I could tell through his reading that he was very vulnerable in some of the information he shared. My critique of the book is that it jumps around in time from telling stories about his toddler years to his parents' illegal relationship before he was born to post-high school. (During apartheid interracial marriage was illegal, therefore, procreation between two different races was very much a crime.) Sometimes the overall story was a little hard to follow since the vignettes were not told in linear format. However, I think he composed the book thematically - sharing stories about his relationships, race relations and apartheid in South Africa, and his struggles with his identity of not really fitting in anywhere. Recommendation: I would definitely recommend this book, and I would actually recommend it as an audiobook. There are several parts in the book where Noah speaks in various tongues. He always offers translation. I also think him acting out the characters gave the book more depth. After reading this book, I adore Trevor Noah just a little bit more than before.